Long-term care facilities and retirement homes offer unique benefits that help you obtain the care you’re looking for. But the difference between a long-term care facility and a retirement home may not be obvious to most people. Understanding the benefits of each gives you the resources to make the best decision that keeps the interests of your loved one and family at heart. 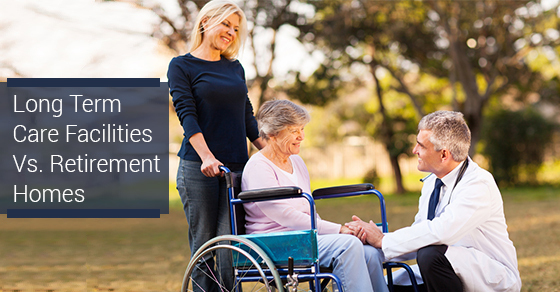 Long-term health care facilities are ideal for individuals who need constant care. By providing 24-hour supervision, these facilities offer the care, safety, and peace of mind you and your loved one need. These facilities give residents personalized care services that extend beyond those that you might find in another facility such as assisted living or retirement communities. These include house cleaning, feeding, and laundry services. More importantly, long-term healthcare facilities adapt to the changing needs of an individual over time. With long-term supervision, your loved one has the right care at the right time. Retirement homes offer a comfortable residence alongside care services. These communities offer a greater level of independence for residents while ensuring that your loved one has the medical assistance they need. Residents cover the cost of their retirement home and care services. These are not subsidized in any way by the government. Retirement home residents don’t have to meet a particular set of requirements related to their health to live in a retirement community. However, they may meet with an administrator in order to identify all of their needs before moving into a retirement community. This ensures that your loved one receives the appropriate level of support. A retirement home is ideal for individuals who prefer to live in an environment with others who are similar in age and lifestyle. Services provided by the community may be optional, which allows you to develop a more customized care plan for your loved one. When considering which option is best for you, consider the unique needs of your loved one as well as their living preferences. More importantly, take the time to look at different facilities. Ask questions to the staff and its residents. Many facilities will be happy to provide referral contacts to help you in the search process. Pay attention to details. Evaluate the food that is provided to residents and observe the surroundings for cleanliness. Is the air-conditioning and heating sufficient for the time of year? Accreditations and certifications can also help you determine the quality of a given facility. You can also research the facility through the Better Business Bureau to determine if any issues have occurred in the past. These and other considerations will provide you with the information you need to make the best choice for your loved one. Knowing the difference between a long-term care facility and a retirement home makes it easy to find the care your loved one needs. It provides them with the long-term support they need and gives you the peace of mind in knowing that your loved one is being taken care of.